Marine Weather Services Chart — How to Make Your Own. For many years the NWS published Marine Weather Services Charts (MSC) that listed crucial information for mariners using their services. 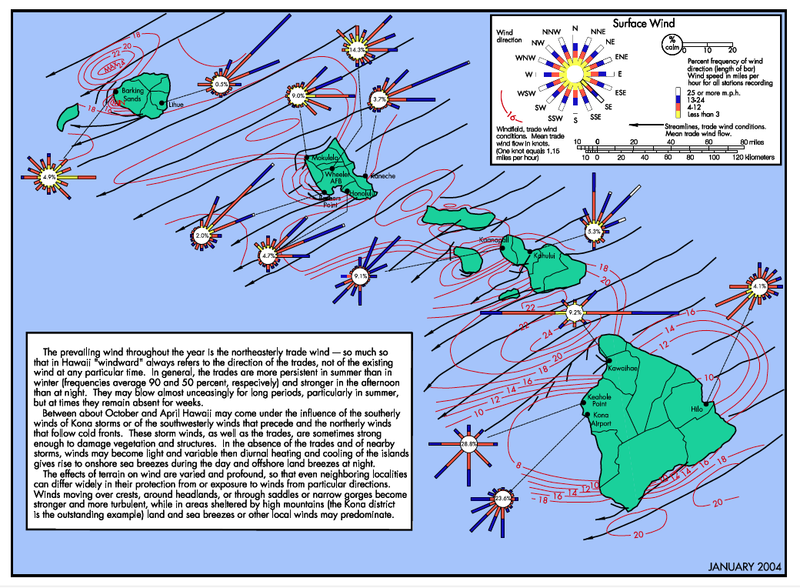 There were fifteen charts that spanned all US Waters. The page size was 13”x 21”, printed both sides, with an annotated great-circle chart of the region on one side and all text on the other. The last printed versions of these are still to be found online from unofficial sources, but they are outdated. The NWS no longer supports them nor makes them available—the only exception is Alaska, MSC-15, which is still available from NWS, although they have trimmed down parts of the original content. Nevertheless, the concept of the MSC remains crucial to good weather work underway. Environment Canada still offers their counterparts called Mariner’s Guide to Marine Weather Services, which are equally valuable for their waters. One approach to the missing MSC is just to print a copy of the last known version and then make pen and ink updates as needed on that copy. On some charts, the changes are few, or not relevant to your needs, and once updated their value remains high. In these modern post-MSC days, the latest data are readily available online, but the challenge is finding it and putting it together into a useful format. There is often too much data! We are faced with the same information in multiple formats, with some parts more convenient than others. Or some seemingly obvious thing we would want at hand underway turns out to be difficult to find online. Remember, the goal is not to provide actual resources, but to provide the information we need to use the resources we have access to underway. So as a temporary solution—hoping the NWS eventually brings them back—we offer here a way to gather together the same data that were on the MSC charts, which you can then combine into some convenient format of your choosing. A sample section of one of the older charts is shown in Fig 1. Then in the following figures are examples of recent equivalent data found online. Table 1 shows the data that were typically on an MSC along with links to where you can get this data to make your own compilation. For regions you plan to sail in, you can download, print and combine into a thin binder of what was in the MSC. Having this information at hand is fundamental to taking advantage of the wonderful resources we have available. The exercise will show clearly why we miss the MSC so much. The latest word from the NWS is they do hope to re-issue some of the MSC as online pdfs, but they do not know when. This might be up to the local NWS Offices. So far the closest we can find is called Marine Weather Information Guide, which is a good start coming from the VOS office. Fig 1. Section of now-defunct MSC-1, Eastport, ME to Montauk Point, NY, showing forecast zones and VHF NOAA Weather Radio transmitters. Blue-green is VHF weather coverage. 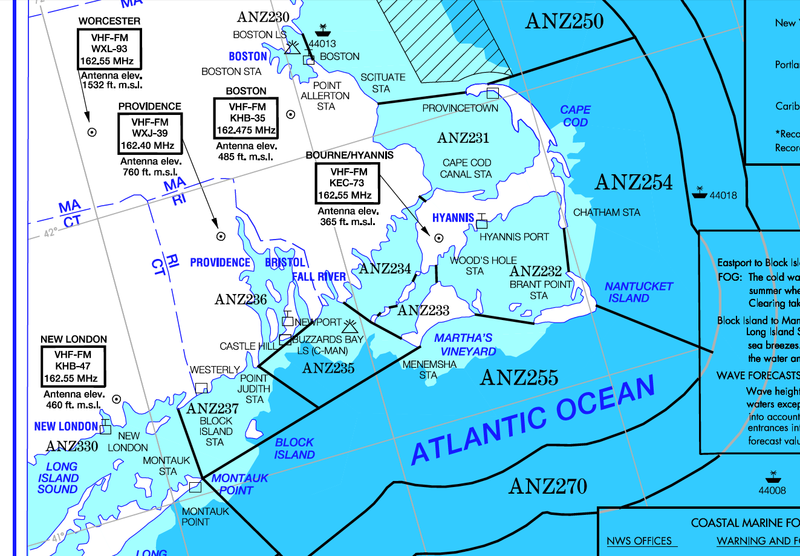 Notice the indent in the coverage approaching Rhode Island Sound, in forecast zone ANZ235. 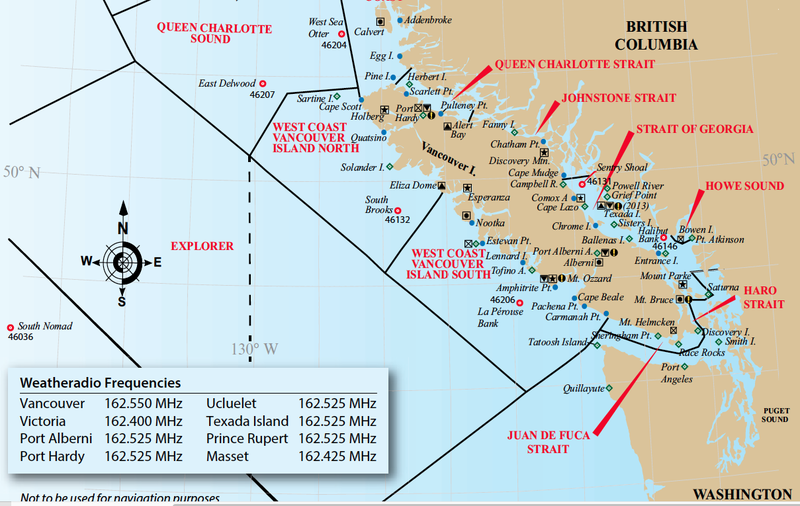 You could get data in this region from the USCG broadcasts of Item (13). Some of these zones (Fig. 2) have changed. then click to state, then click the station, then click the map for an excellent pdf. 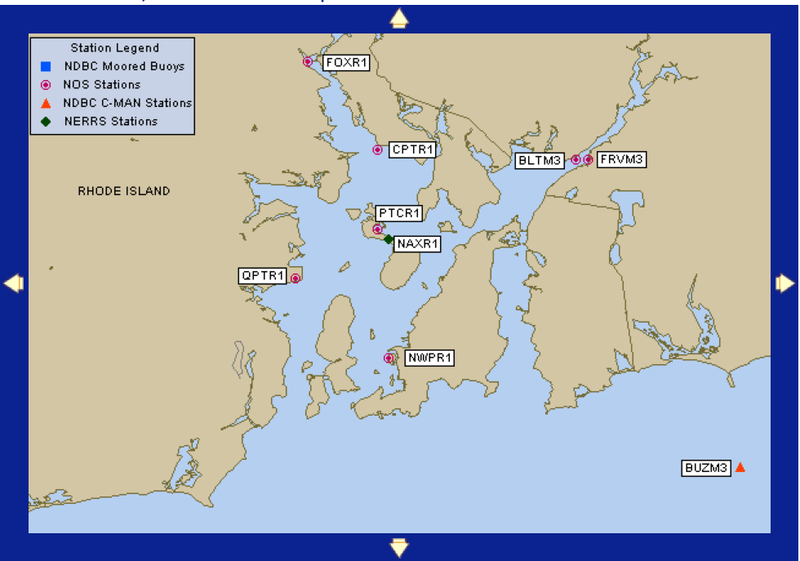 OBSERVATION STATIONS (light houses, buoys, etc) used in NOAA Weather Radio reports. then click a region, then zoom in for a plot of the stations to print, then click each one to get the name of the station to transfer to your print. TERMINOLOGY used in weather reports and forecasts. LOCAL NWS OFFICES responsible for each of the forecast zones. USCG HF VOICE high seas and coastal broadcasts. NAUTICAL CHARTS, how to order. These are the repeats and relays of weather information on VHF 22a, which reach out farther than NOAA Weather Radio. CANADIAN weather broadcasts when applicable. for mariners, unique to the region. PORTS — Physical Oceanographic Real-Time System. Covered well in AK on MSC-15, but this seems to be a service of the local NWS Offices, so you will need to check with your local NWS Office. See Item (5). General and special information about the local forecast zones covered. Fig. 2. 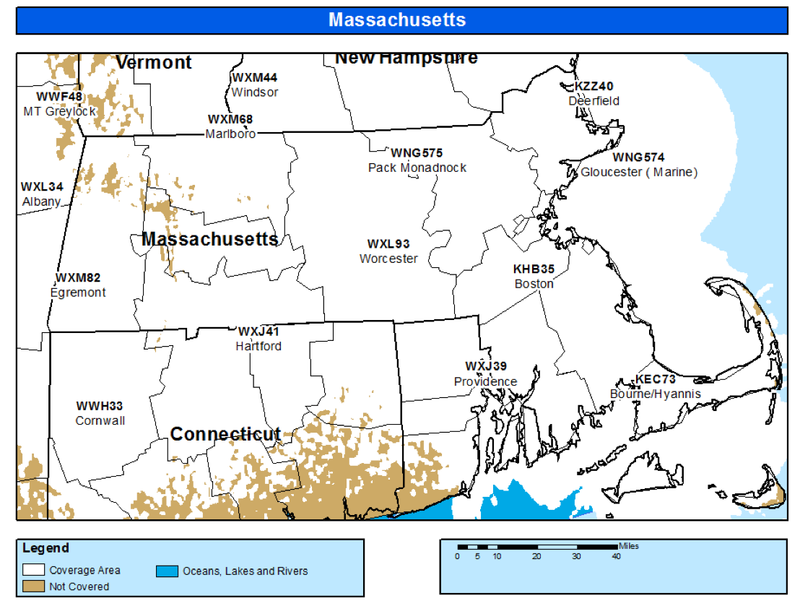 Coastal forecast zone maps available online, from Item (1). Coastal forecasts in the outer coastal zones (we outlined in red) offer only warnings. They overlap the Offshore zones on the East Coast north of Charleston. Full forecasts in these outer zones come from the offshore forecasts. Fig. 3. NOAA Weather Radio coverage (white areas). The online data shows the coverage gap as well. See Fig 4. Fig 4. 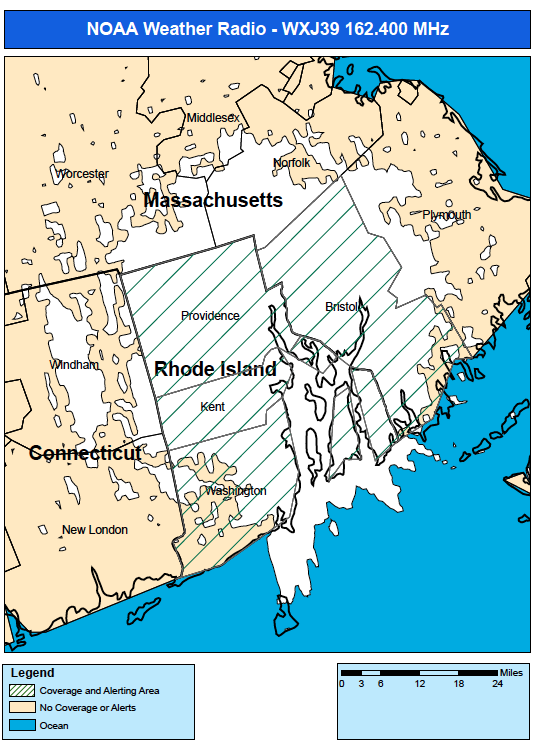 Detailed coverage map of WXJ39 Providence (WX2, 162.400 MHz) showing why there is a gap in the coastal coverage. It is an inland station and there are is no overlapping coastal coverage. Fig 5. Locations of the observations stations reported on NOAA Weather Radio, from Item (3). We must then click each online to ID the station and make a list. These are the places we get recent observations from (updated every 3h) in the continuous NOAA Weather Radio broadcasts. Fig. 6. Back of the out of print MSC-13 for Hawaii. Fig. 7. Section of a Canadian Marine Weather Services Chart. Their offshore zones have names, ie "Explorer." As is the case with tricks for finding directions from the stars, there is no exclusive way to tell time from the stars, so we are free to make up whatever method works. To make up generalized star clocks that work on any arbitrary day of the year, however, does require some background, to be reviewed here. It is much easier to make up specific clocks on the spot, using a correct watch to calibrate it for the present date, and then use it on following nights by applying a simple daily correction. This does not require special reference books and calculations. To tell time from the Big Dipper, as one example of a generalized star clock, imagine its pointers as the end of clock hands whose pivot point is Polaris and imagine a 24-hour clock face printed backwards on the sky around Polaris as shown in Figure 1. Midnight (0000 hours or 2400 hours) is straight up from Polaris; 0600 hours is to the west of Polaris and 1800 hours to the east. In 24 hours, the pointers sweep counterclockwise once around this clock face. When the clock hand points straight up from the horizon, the clock reads midnight; when the hands point east with the pointers lying parallel to the horizon the clock reads 1800, and so forth. To read the clock at any time of the night, estimate the hour and fraction of an hour from the relative orientation of the pointers on the imaginary clock face. That’s all there would be to it if the sun kept pace with the stars. But the sun does not keep pace with the stars, and our daily time keeping is based on the sun so we must make a correction for this. All star clocks are fast; they gain 4 minutes each day because we keep track of time relative to the location of the sun, and we are moving around the sun relative to the stars at a rate of about 1º per day (360º/365d). Thus when we make our daily 24h rotation from noon to noon (relative to the sun) we are then 1º farther along our orbit, so we have passed any stars overhead by 1º. At our daily rotation rate of 360º/24h this 1º is equivalent to 4 minutes. To tell time from the Big Dipper, we need to know how many days have passed since March 8th. The time we read directly from the star clock is then fast by 4 minutes for each of these days. As an example, suppose the date was September 22nd and the stars looked as they do in Figure 1, with the star clock reading 0830. September 22nd is 198 days past March 8th, so the clock is fast by 198 × 4 minutes, which equals 792 minutes, or 13 hours and 12 minutes. The first 12 hours of the correction just switches the time from AM to PM, so the correct time of night is 2030 - 0112, which equals 1918, or 7:18 local time. Figuring the correction is a bit involved, but this preparation need only be done once, after which the results can be rearranged to be more convenient. On September 22nd, for example, you could make an equivalent new rule for reading this star clock: change the star clock time from AM to PM (or vice versa, later in the night) and then subtract 1 hour and 12 minutes. Each subsequent night, you would subtract an extra 4 minutes, because the clock is still gaining time each night. The time you figure from the corrected star clock will be the proper standard time for your time zone to within, at worst, some 30 minutes. It would be exact only if you happened to be located right in the middle of a time zone, each of which is about 1 hour wide according to star time. Star clocks also do not know about daylight saving time, so when daylight saving time is in effect, you must add 1 hour to the final result. Corrections for both longitude (the time zone correction) and for daylight saving time can be made simultaneously if you calibrate the star clock with a known time. In the last example, if the uncorrected star clock read 0830 AM at a time you knew was 8:10 Pacific Daylight Time, the rule becomes much simpler: subtract 20 minutes tonight, and then 4 minutes less each subsequent night. The final accuracy of the time obviously depends on how accurately the star clock itself is read, which requires an estimate of the angle between the clock hand and the horizon—similar to reading a stylish watch with no numbers on the dial. Sticks held in one line with the Pointers and one with the horizon can help with this. The angle found this way can then be transferred to a sketch of the clock or to the compass rose of a chart. Reading the clock by eye alone, however, is usually adequate. Note that in normal circumstances most people have an adequate sense of time even without a watch, but under a great deal of stress this is not the case at all. During long storms at sea, it is possible to even lose track of how many days have passed. This is not likely to happen in a routine cruising, but one could imagine getting caught in coastal waters at night without a safe harbor nearby. If the wind and seas began to build on top of this, one could easily muster enough stress to lose track of time. Without a watch, you could monitor the duration of the adventure with the stars. Stargazing for orientation in time and space clearly requires some hands-on practice. It is not like learning the combination to a lock, that once memorized can be opened at will. It is more like learning to play a kazoo. You start by learning to play a few notes well, and pretty soon you are playing a fine tune. And the enjoyment to be had from exercising this skill can be just as rewarding. It is one way to get in a little more in tune with a dependable part of the environment. The above is adapted from our book Celestial Navigation: A Complete Home Study Course.